Offset by a vibrant arrangement of contemporary art splattered across the interior, Japanese Shoji lamps — spherical translucent paper fixtures — were the only telltale signs that I had entered Lifting Noodles Ramen, a new food stall. The traditional Japanese restaurant, located in East Atlanta’s Global Grub Collective on Flat Shoals Avenue, is squeezed between two larger, more lavish restaurants. As soon as my friends and I found the line, however, we soaked in the sounds of people slurping their soup and chatting — the energy of the place invisible to us from the street-side entrance. Offering vegetarian and meat options, including pork and chicken, the establishment takes no shortcuts in its preparation of a hefty portion of steaming hot, flavor-packed ramen. For my entree, I ordered the Village “Classic” Ramen: roasted pork paired with sauteed sweet corn, shiitake and black mushrooms, bok choy, bean sprouts, scallions, pickled ginger and roasted seaweed. All of their ramen dishes consist of wheat noodles, an immediate turn-off for any gluten-free customers. With poor service (almost non-existent) at Lifting Noodles Ramen. I filled up my water from a water cooler, and then retrieved my entree and paid at a Square payment machine. The Village “Classic” had been plated with immaculate precision: vegetables in separate quadrants of the bowl topped with seaweed shavings — visually identical to the photo showcased on the restaurant’s Instagram page. 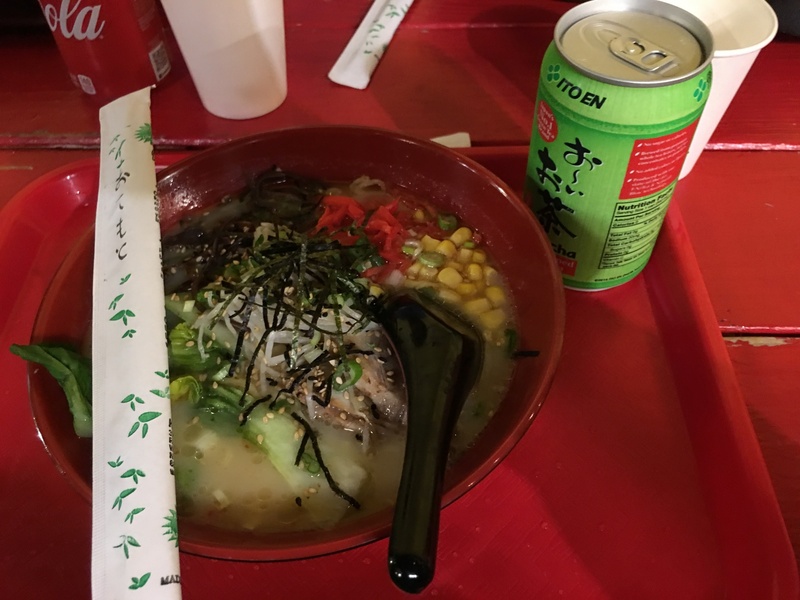 As soon as I drank a ladle-full of the broth, its saltiness overpowered the pork flavor, and, in spite of a kick of spice, the broth seemed imbalanced. In an attempt to balance out the saltiness, I dowsed the dish with spicy sauce made from red pepper flakes, unfortunately overpowering the dish with spice. With my chopsticks, I wrapped the steamed vegetables around the al dente noodles, which instantly transported me back to my dining experiences in Shanghai. The roast pork — soft and succulent — melted in my mouth, and the pickled ginger provided the acidity that lifted the dish over the top. With my broth tarnished, I forewent the opportunity to instead slurp down the “creamy” pork soup. Sweating like a dog, I gulped my $3 chilled green tea to prevent my tongue from falling off. In the future, I would request medium spice for the Angry Zuko Ramen or leave the chili sauce off my plate altogether. Additionally, my ramen did not come with the marinated soft-boiled egg, as promised on the menu. My two friends — both vegetarians — ordered the 1-UP Ramen: wheat noodles and creamy vegetarian broth paired with an assortment of vegetables. They said their entrees were under-seasoned and reminiscent of oatmeal in mundaneness. While they were ambivalent about the dish, after they too added the chili concentrate, the heat of the entree had them coming back for more. Considering only a small sign displayed the restaurant’s name and the windows were tinted, we expected Lifting Noodles Ramen to be empty. Instead, the banquet hall opened up to more than 30 customers sprawled from end to end at picnic tables. There was barely room to stand. The restaurant had remnants of a once-bustling art gallery, and I soon became an admirer of abstract graffiti art and party banners slung across the interior. We quickly pushed through the crowd to the back of the restaurant, where we were eventually found the freshly opened food stall. I felt compelled to hang around the assembly station — my mouth watering as I watched the frantic chefs put together each bowl. Lifting Noodles Ramen provides a casual, new-age dining experience for students searching for a fresh-to-order alternative to Emory staples like Emory Village’s Dragon Bowl and Emory Point’s Boruboru. Overall, dining at Lifting Noodles Ramen was a positive experience. I can safely recommend the Village “Classic” roasted pork ramen and loved the non-traditional decor (5/5 stars), but I would go easy on the spicy sauce. The staff could have paid more attention to completing an order in its entirety and seasoning the food better. But the incredible treatment of fresh ingredients made up for it. With its entrance into specialty Japanese cuisine, Lifting Noodles Ramen is an unconventional dining experience that respects its roots but challenges one-dimensional thinking.